Amid all the depressing stories last week — the violence in the Middle East, the first Ebola case in the U.S., the bitter congressional races that have been unfolding — it was comforting to see one bit of upbeat nostalgia thrown into the mix. It’s the 45th anniversary of the release of The Beatles’ Abbey Road, the postscript to the reign of pop music’s most celebrated band. The record hit the music stores at a time no less turbulent than our own, and there was tension within the band to match. The miracle is that not only did Abbey Road get made, it was stocked with classic pop tunes that still get air time today. It was originally going to be called Everest, after a brand of cigarettes their engineer smoked. Some reports say that the four had even discussed traveling to the Himalayas to shoot the photos for the album. But the lads weren’t getting along in those days, so somebody said let’s just get it over with and take the pictures outside the studio. The BBC says a photographer took 15 minutes to do the crosswalk photo. “He stood up a stepladder while a policeman held up the traffic, the band walked back and forth a few times and that was that,” Brian Southall, who wrote a history of Abbey Road Studios, told the British news agency in 2009. Come Together, which kicks off the album, was originally written by John Lennon as a campaign song for Timothy Leary’s run for governor against Ronald Reagan. But Leary had to confront legal problems instead of political issues. When he objected to the song’s inclusion on Abbey Road in a letter to Lennon, the singer wrote back that he was like a tailor who had made a suit for Leary, and Leary didn’t pick it up so he sold it to somebody else. Lennon told Rolling Stone that the lyrics were “gobbledygook,” but fans have speculated over the years that each verse is based loosely on one of the The Beatles. “He one holy roller,” refers to George Harrison; “He wear no shoeshine,” to Ringo Starr; “He Bag Production” to Lennon himself; and “He roller-coaster” to Paul McCartney, a reference to his White Album rocker, Helter Skelter. 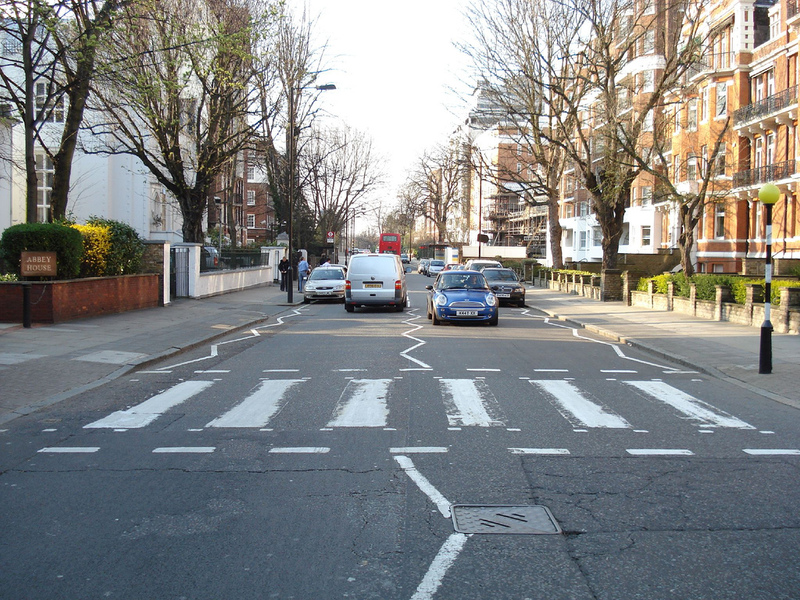 Interestingly, Abbey Road did not get universally great reviews. More than four decades later it’s viewed as a pop music classic, but a New York Times writer called it “an unmitigated disaster,” although he liked the medley on side two. He seemed to think that the group had become a bit too grandiose. In the early days, “They didn’t attempt anything profound,” wrote Nik Cohn, who had said some unkind things about the White Album the year before. ” ‘She was just 17, you know what I mean’; it wasn’t great art, but on its own level, it worked just right. It was strong and it was evocative. McCartney liked to reprise themes on albums, as he did on Sgt. Pepper’s Lonely Heart’s Club Band — and on side two of Abbey Road. Less mentioned is Lennon’s use of the same musical theme to introduce I Want You (She’s So Heavy) on side one and Because on side two, the latter of which was supposedly based on Beetoven’s Moonlight Sonata. I was not a big fan of side one of Abbey Road, but Harrison’s song, Something, became the second-most covered Beatles song next to Yesterday. Why has all this music survived? It’s because Beatles music tends to have a timeless quality (Nowhere Man; Hey Jude; Here Comes the Sun) that keeps it relevant. The band has been popular with each new generation, and some of the lyrics seem as fresh today as when they were first recorded almost 50 years ago. For example, from Abbey Road’s You Never Give Me Your Money: Out of college, money spent/ See no future, pay no rent/ All the money’s gone nowhere to go. That must echo for today’s youth.